Windows 10 has been updating the search to only use Cortana, Microsoft’s digital assistant. This assistant might be useful to you and Microsoft has put a lot of time in making Cortana reasonable to use. Some people would rather have the good old basic search that only shows the programs and the files on your local computer without all the web results and options fro the assistant. Recent updates from Microsoft have change the location of the settings so that you must sign in to Cortana in order to disable options like ‘Show Web Results‘. 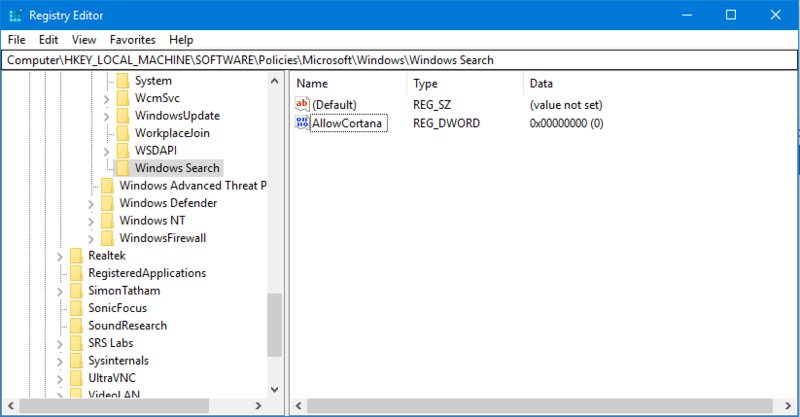 There is a way to disable Cortana and change her back to a dumb search box for your system with a few simple edits to the windows registry. Be warned that changing the registry can have major impact on your systems stability if you are not careful. Open Windows Registry by pressing Win+R on your keyboard to get the run dialog. Type ‘regedit‘ without the quotes and press Enter. You will get a UAC confirmation dialog that you will want to accept to continue. We will want to make a backup of the registry so that if something happens we can roll back the changes. Click on file and select export. The save dialog will open, at the bottom of the window under ‘Export Range‘ select ‘All‘. Enter a file name that you will remember and then press ‘Save‘. Navigate to the Registry Key HKEY_LOCAL_MACHINE\SOFTWARE\Policies\Microsoft\Windows\Windows Search if you do not have the key ‘Windows Search‘ you can create it manually. You will need to restart your system for this setting to take effect. After restarting you will see that the normal Cortana circle icon on the taskbar has now been replaced with a magnifying glass icon. Enjoy searching for files without all the extras that Cortana cluttered up the results with. This entry was posted in Windows and tagged Cortana, Disable, Fix, Windows on May 9, 2018 by nightred.